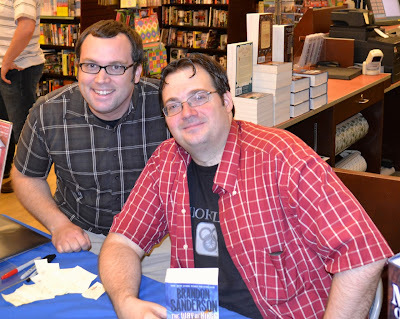 I came across this screen cap image of Brandon Sanderson working on his latest book. That's pretty cool but as a writer there's much more in this image on the right hand side and it is very impressive and inspiring to me. Over there you can see only a portion of the projects he has, is, or will be writing. It goes from 6 to 32 but it looks like if he were to scroll down there would be more folders with novel names on them! That is so cool that he has so many books he's written and is planning on writing. No wonder I heard him say at his book signing in my home town last week that Isaac Asimov is an author he respects. Asimov wrote hundreds of books. Brandon is a guy who decided he wanted to write novels for a living so, partly while in school, he worked the night shift at a hotel so he could knock out tons of novels, which he did, before getting one published. He wrote like crazy and learned the craft by completing one novel after the other. So by the time his "first" book Elantris came out the dude had already written thirteen novels, Elantris being his fifth book. He has earned a Dropbox folder full of novels written, writing, and to write. I thought it would be fun to share an image of my books in the cloud. Instead of dropbox I use Google Drive. It looks like the novel I'm working on now should be the last one I have to write before I get published :) Kidding aside I have found that it's one thing to be able to write well and it's a whole other thing to be able to write a complete story well. 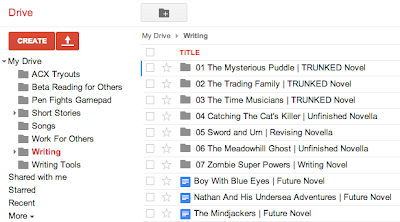 There are things I love in my trunked novels but they all pretty much need to be rewritten if I'm going to publish them. I've learned a lot and I'm hoping that moving forward I'll be able to get all of the stories I write to a place where I think they are fantastic and worthy of publishing. So here's to Brandon being an inspiration. I hope that someday my Google Drive looks like his Dropbox. Are you inspired? Leave a comment about it. Even better leave a comment with a link to an image of your writing folder! Just because I can, here's that picture of Brandon and I at his signing in my home town last week one more time. :) Thanks for stopping by. In The Charts on Wattpad!